The best things to do in Todi. Our mini-guide is here to suggest you things to do and the best things to...eat to discover Todi's authentic flavors! The beautiful and elegant medieval town of Todi stands on the top of the hill overlooking the beautiful Tevere Valley. Located just a few kilometres from Perugia and Orvieto, the town is limited by three rings of walls (Etruscan, Roman and medieval) that contain countless treasures. Let's begin our Todi tour from Piazza del Popolo, the heart of the city, overlooked by some of the most important buildings of the historic center that contrast the religious ones. Take a picture from the Cathedral's stairs is definitely one of the best things to do in Todi! Here you can see the whole of the Town Hall, born from the union of the People's Palace that hosts the Lapidary Museum, the Art Gallery and the Museum of Roman Etruscan, the thirteenth-century Captain Palace and the Priori Palace, perhaps the most beautiful, which was completed in the fourteenth century. The Cathedral, built in the twelfth century on the ruins of a temple dedicated to the god Apollo, is characterized by a long flight of steps and a beautiful Romanesque façade. Going up the stairs, from the top of the stairs, you can take fantastic photos of the entire Square. Not far away, about 20 meters from the square you will meet with St. Fortunato Church, dedicated to the saint patron of the city and built in the thirteenth century, which houses the tomb in the crypt of the humanist poet Jacopone da Todi and has a beautiful fresco by Masolino da Panicale. Perhaps you did not know that ... >> Jacopone da Todi became a monk when he was 48 years old and was excommunicated and jailed when he was 67 for opposing the election of Pope Boniface VIII . Centuries later he is still a discussed figure, uncomfortable to the point that on his tombstone the date of his death was intentionally brought forward by ten years, to not show the period of his excommunication. You must see also the marvelous Consolazione Temple, built in the sixteenth century and designed by Bramante, who has a structure with a central plan and is surmounted by a beautiful dome. To truly experience the beauty of Todi, we suggest you to visit its underground treasures, the cisterns. Built by the Romans, are located just below the Piazza del Popolo and were used to collect rainwater. One of the best things to do in Todi is surely immerse yourself in the Middle Ages through the medieval districts; within the narrow lanes frequently opening the doors to all sixth of the ancient craft shops, belonging, during the medieval ages, to the twenty-three corporations of arts and crafts that dominated the economic lifetime of town. Situated next to Piazza del Popolo, Piazza Garibaldi offers a breathtaking view of the countryside below, and to find another beautiful view we suggest you get on its highest point, the bell tower of San Fortunato, from which you can even see Perugia. 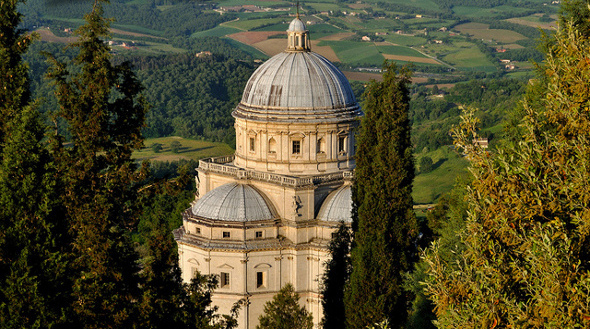 >> Do you want to discover Todi's medieval treasures? Check it out now of the best farmhouses in Todi. Perhaps you did not know that ... >> In Todi there is the painted house of Patrick Ireland (aka Brian O'Doherty) and Barbara Novack, a real work of contemporary art that hides deep symbolic meanings. The key to solve the riddle is the Ogham, an extinct language for over 1,200 years by the ancient Irish translated lines in the Roman alphabet. So, those which seem rigors geometric ends in themselves turn out to be the letters. And the surprises continue when you discover that behind such a choice, as to that the name Patrick Ireland was choosen to remember the innocent victims of 1972 Bloody Sunday. 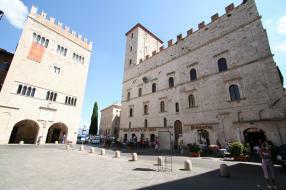 There are offers for vacation rentals and hotels in the areas of Todi! Click and Consult them immediately. If after all this walks you deserve to take a culinary stop here is some suggestion about what to eat in Todi. See the best restaurants in the area of Todi! >> Click here and book. On the tables of Todi next to the traditional bread you will certainly find the pan caciato (or nociato), a small round loaf with walnuts, cheese and raisins. 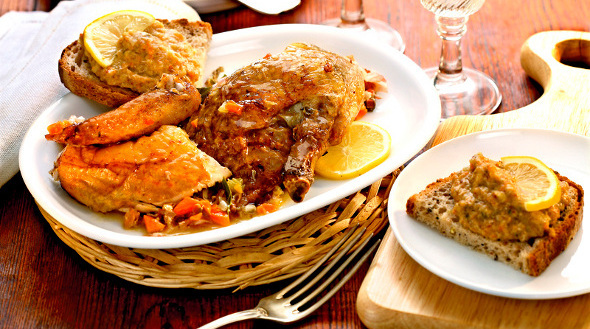 But the Todi typical culinary specialty is called "palomba alla ghiotta", that is pigeon cooked slowly, skewered on a spit, "with good coal, but without flame." We recommend you also a good glass of Grechetto di Todi DOC, a white wine with a typical intense straw yellow color, rich in delicate floral and fruity notes, perferct to accompany Todi's food. If you've decided to visit Todi and taste Umbrian cuisine you should contact now farmhouses near Todi >> click this link.